Normally I wouldn't post a 'work in progress' but if you want to make an awesome homemade gift for the holidays, now is the time to get started on this one. 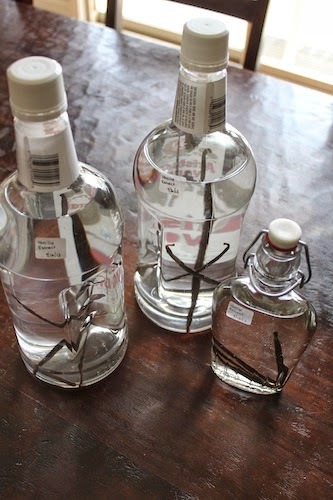 I stumbled across these tutorials last year, way too late to get on the homemade vanilla extract train for gifts. I swore I would do it this year and (much to my surprise) I remembered. This is ridiculously easy to do and only requires a little advance planning. Recipe from various tutorials throughout the web. I did my own variation based on memory. 1. Divide up your vanilla beans for your bottles. I used approx 3 whole beans for the large bottle of vodka. I don't think you need to do much more than that. I used two for the smaller bottle and just cut them in half. 2. Slice through the center of the vanilla bean to help 'free' the inside vanilla paste from the beans. Place beans in the bottles. Seal bottles. 3. Store bottles in a cool, dark place. Shake them around every week or so. The vanilla extract will be ready in approx. 3 months. 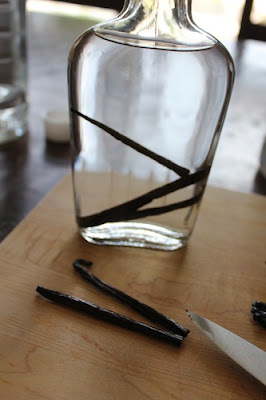 Once it's ready, transfer the vanilla into your bottles. Seal, label, and gift! You'll find that it doesn't take long before the vodka starts taking on an amber color. Just keep it stored, shaking it from time to time, and soon you'll be ready to divvy up your unique gift. You can find vanilla beans all over the web! Some quick searches led me to Beanilla, Ebay, and Amazon. I went with the latter because I was going to be buying a few additional supplies there. 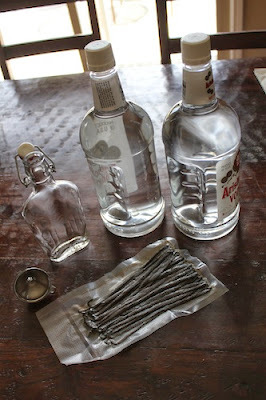 I also picked up a glass bottle to store some of the excess vodka - and to make my own bottle. But the bottles that I will distribute as gifts will probably be the amber Boston round bottles. I will post an update to this entry in a few months when I get ready to assemble the vanilla, but I wanted to let you all join in the fun if you decide to make these as a holiday gift!